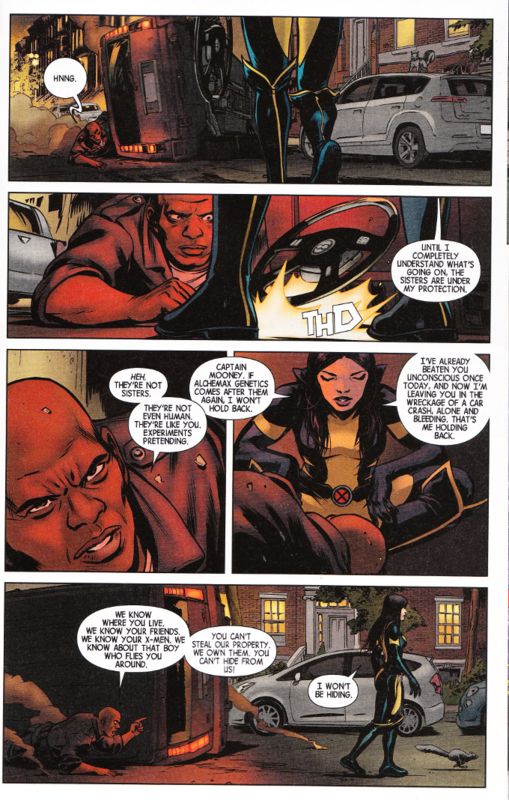 Laura Kinney's first mission as the new Wolverine isn't off to a stellar start. While she successful stopped an assassination attempt, she also discovered the assassin was a clone like her. As in, exactly like her! Now Laura has uncovered the clone's "sisters" - all part of the same batch created by the sinister Alchemax Genetics. But Alchemax wants their rebellious property back. And while Laura can handle herself in a fight, it remains to be seen if she can cope with three equally strong-willed young women who don't share her desire to avoid killing. I don't usually associate humor with Wolverine as a title but I do associate it with the writing of Tom Taylor. There's a wit to all of Taylor's writing that is unique and it's adapted quite well - scarily so - to the darker tone this series requires. This is not to say that things are all laughs. Far from it! There's plenty of action as well as some general badassery. Overall, the tone is sharp and well-balanced, like a katana. The artwork is just as good as the writing. David Lopez and David Navarrot are performing miracles on a monthly basis. And the colors by Nathan Fairbairn are well chosen and always thematically appropriate.